Are your borders begging for a pick-me-up? If your garden is in need of some TLC this summer, adding a stylish garden border edging can quickly transform your garden and give it a well-groomed appearance. Garden border edging is also perfect for those with busy lifestyles who want to spend less time maintaining their garden; garden edging will prevent grass from invading your borders and reduce the need for edge trimming! 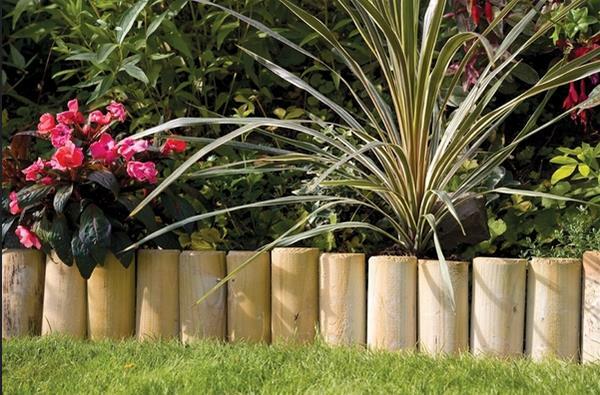 Log edgings are a simple yet, effective way to line your garden borders. Natural logs will blend seamlessly into most gardens decors and showcase your garden plants. The easiest way to create a log border is to use log roll edging. 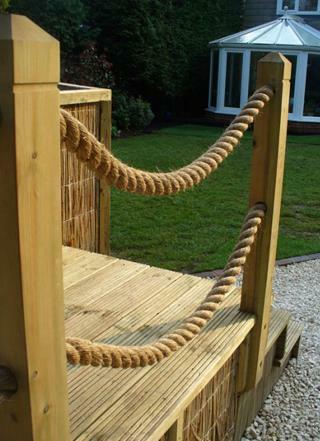 This ready-made edging is made from round or half round logs which are joined together by flexible wire or material. This makes log roll edging extremely easy to transport and install; it’s the perfect choice if you’re not a DIY enthusiast! 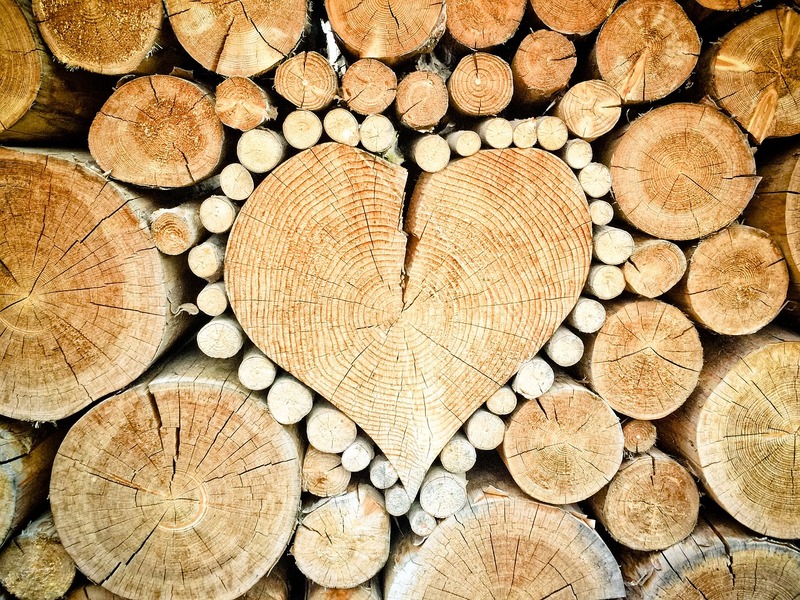 eDecks’ Top Tip: when you’re buying log border edging, make sure that the wood is pressure treated so it’s resistant to damage from insects and fungus. Classic brick garden border edging is a popular choice amongst gardeners who want low maintenance yet, stylish garden edging. 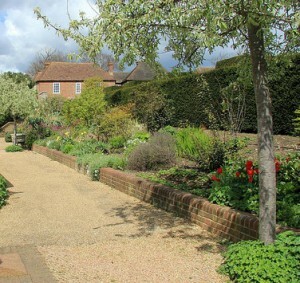 Garden bricks are widely used in gardens as they can withstand anything the unpredictable British climate can throw at them and, they’re relatively inexpensive. When you are laying the bricks, push them together as close as possible to prevent turf from growing between the gaps. Looking for brick garden border ideas? Why not use decorative bricks to create a stand-out garden feature or, try old style bricks to enhance the appearance of a rustic cottage garden. 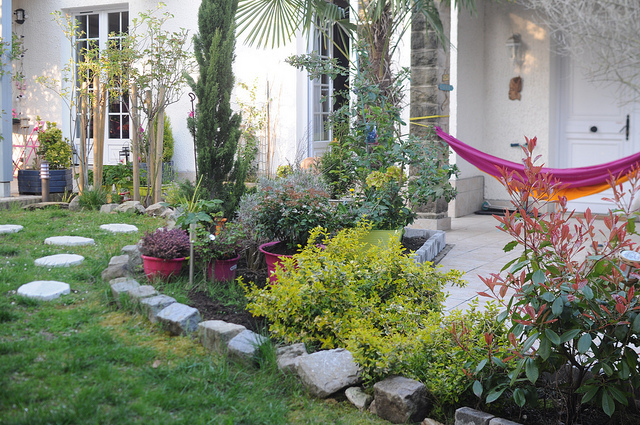 Rock border edging is perfect for creating an informal relaxed garden edging. Mix and match different shapes and colours to give your garden border a relaxed appearance. Although a rock border is extremely easy to create, it requires more maintenance than you might expect. Once the rocks are in place, watch out for lawn or weeds growing in-between the gaps which could spoil the look of your well-manicured lawn. Find a fantastic range of high quality garden border edging supplies at eDecks today. This entry was posted in Gardening Advice on July 28, 2014 by peach. There is nothing more satisfying than enjoying your beautiful garden in the sunshine. After you’ve carefully tendered to young plants, meticulously mowed your lawn and fought with wicked weeds; it’s time to sit back and reap the benefits of your hard work. To help keep your garden in tip-top shape we’ve pulled together a few handy tips to help you maintain that beautiful green glow in your garden. Garden lawns are more resistant to long periods of dry weather than plants and flowers are. However, you know your lawn is parched when you notice your grass is turning yellow then brown, becoming limp and in extreme cases, developing bald patches! During the warm summer days it’s important to help your plants retain as much moisture as possible. When the weather heats up, your plants can quickly loose moisture through their leaves. A good starting point is to protect them from excessive sunlight and heat. The sun’s rays are most intense during the afternoon so, move delicate pot plants and hanging baskets into a cool, shady area to protect them from damage. If you are unable to move larger flowerpots, try adding a light shade to your plastic pots to help deflect the sun’s heat and harmful UV rays. Taller plants or trees in your garden are perfect for protecting young or small flowering plants. Wind is another problem for your plants during the summer as it can also strip away any moisture retained in the leaves. Our top tip is to cover delicate plants with a light polythene sheet to prevent wind damage which could stunt their growth. Almost every drop of water plants need to survive is taken in via their roots. Encouraging your plants to develop strong, deep roots will make it easier for them to absorb essential moisture in the soil during dry spells in the summer. Try to use large flowerpots where possible to encourage your plants to grow wide roots that reach deep into the soil. Create the best conditions for your plants by loosening chunks of hard-packed soil to make it more porous. This will allow the soil to fully absorb the water so it reaches deep down to where your plants roots are. Another way to improve the condition of your soil is to add a thick layer of organic mulch. This will provide the soil with the necessary nutrients needed to nurture your new plants and, reduce the amount of moisture lost through evaporation. Even in times when gardeners aren’t restricted by hose-pipe bans, using the right amount of water is essential for your plants’ survival this summer. A good thorough watering of your plants twice a week is far better than a daily sprinkle from the hose. Soaking the soil thoroughly will encourage your plant’s roots to grow deep into the soil as they won’t need to come up to the surface for water. The most effective time of the day to water your plants is during the evening or early in the morning when the cooler temperatures will allow the soil to absorb the most moisture. If you water your plants mid-day the heat will cause the water to evaporate and your efforts will have been in vain. We always check to see if the top of the soil is damp before watering. 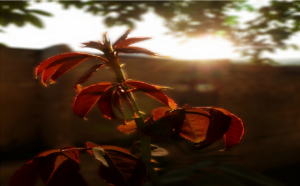 If it is, then move on however, if you see a plant withering, you should water it immediately. Try to avoid watering plants when the leaves are in direct sunlight as the sun will cause scorch the leaves and will do more harm than good. Of course, if you are away on your travels over the summer, make sure to move your plants to an area where they will receive regular shade. Taking care of your lawn is just as important as caring for your flowerbeds. If your grass still shows footprints after a couple of days after it has been trodden on, it’s a tell tail sign that your lawn needs a bit of TLC this summer. Although grass is better equipped to handle long periods of drought, your lawn still need a bit of love and attention during the summer. Help to ventilate the soil underneath your grass with a garden fork. This will also help water to penetrate the surface of your lawn. The best time to water your lawn is during the the evening and, avoid walking on it if possible immediately after it has been watered. 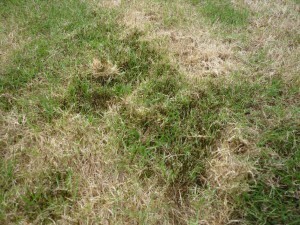 It takes a lot of energy for grass to grow back after mowing, which is an issue in a demanding summer’s day. The trick is to try to cut less frequently than you would normally expect to. Raise the height of the lawn mower blades so they won’t demand as much energy to grow. As an added bonus, that the extra length of grass blades will also protect the grass roots from the strong sun. Our final tip would be to kill any weeds or patches of moss you see developing as they have a bad habit of stealing moisture from your lawn. If you need a quick and easy way to get rid of weeds , why not have a look through our available effective and fast acting weed killers. Please add tips or inspirations that have helped you grow your garden! You may even feel like taking a tour through our website to see a brilliant range of garden furniture and accessories. This entry was posted in Gardening Advice on July 24, 2014 by peach. During the summer your garden decking is the perfect place to host lively BBQs or relaxed garden parties. 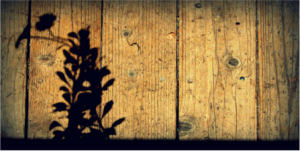 However, while you’re enjoying the warm weather, the sun’s UV rays could be damaging your decking boards. Don’t leave your decking exposed to the elements! Setting aside an afternoon to clean and protect your deck will extend the lifespan of your decking boards and instantly refresh your garden for the summer. Cleaning your decking might not be the most exciting thing on your to-do list this summer but with our quick guide on the best way to clean decking, you’ll be able to get the job done in no time! Start by removing any garden furniture or potted plants from your decking. You want your deck to be clear from any clutter or obstructions that could prevent you from giving your deck a thorough clean. If you have climbing plants that use your decking rail as a climbing frame, protect them by covering the vines with a light polythene covering. Now that you have cleared your deck of any clutter, it’s time to remove any debris that’s gathered other the summer months. Lift any large items of debris by hand and use the broom to sweep-up leaves, twigs, etc. into the rubbish bags. There are two ways to apply decking cleaner; you can either apply it by hand or using a pressure washer. Doing it by hand will be cheaper if you don’t already own a pressure washer but, it requires a bit more time and effort. Remember to give your decking handrails and stairs a thorough clean too! If you’re washing the deck by hand apply the solution directly onto your broom and use it to sweep the deck clean. It’s important to reach all of the corners with your broom in order to get rid of any mould could be lurking from the wet winter months. Pay extra attention to stains, algae and mildew which has accumulated on your deck but, be careful not to scrub too hard in case the wood splinters or cracks. If you have a pressure washer handy, simply add the cleaning solution to the tank and spray directly onto the wood. 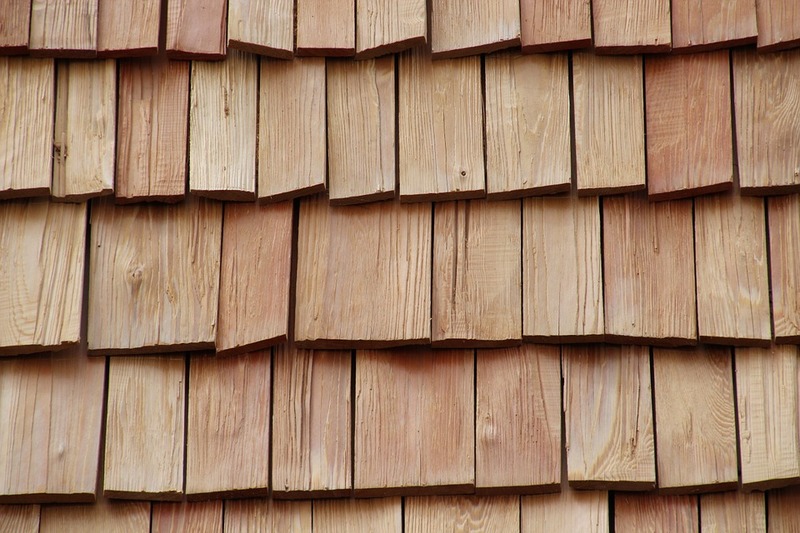 Make sure that you use the correct settings to avoid putting unnecessary pressure on the wood. After you’ve applied the decking cleaner, use a garden hose with a spray gun nozzle to rinse your deck. 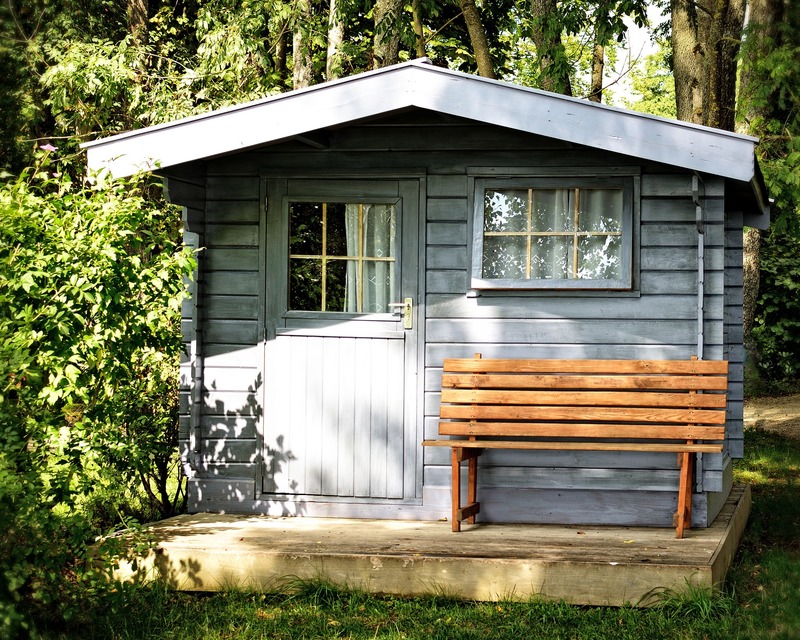 Investing in a good wood preserver is the perfect way to give your deck a polished appearance and protect it against attacks from wood-rotting fungi. 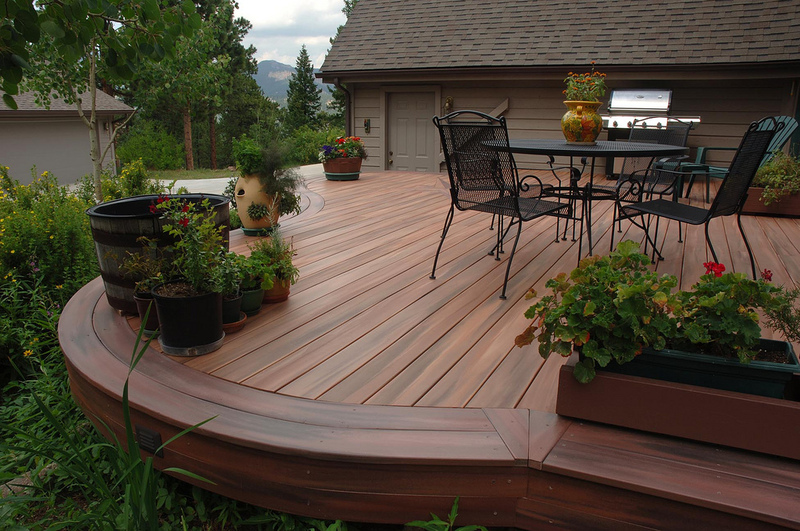 The type of decking preserver you use depends on the type of wood your patio is made from. 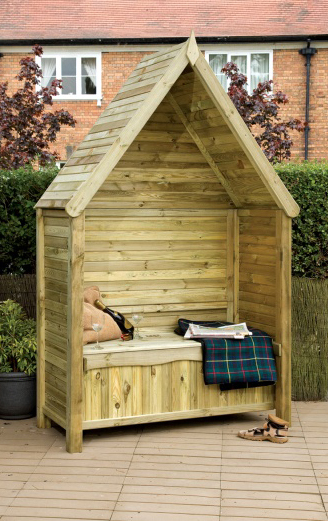 Our top tip is to use a waterproof preserver for year round protection from the unpredictable British climate! Find a fantastic range of decking stains and preservers at eDecks. Visit the site today for high quality gardening supplies at great discounted prices. This entry was posted in Decking Advice on July 18, 2014 by peach. July is a fantastic time for gardeners. This month your summer garden will have reached its peak and you’ll be able to enjoy the warm summer days in your own private garden paradise. To keep your garden looking great during the summer months, follow our gardening tips for July then sit back and enjoy your beautiful blooms and lush lawn. By July, most of your summer plants will be in full bloom but there’s still time to boost your flower garden by planting colourful flowers which will bloom until the early autumn. If you want instant colour in your garden, you’ll be able to buy ready-to-plant potted flowers at most garden centres. Thoroughly water our plants at least twice a week. This will encourage the plants to put down deep roots by searching for water in the soil rather than coming up to the surface. July’s warm, humid days are ideal for growing a gorgeous lawn but if you’re not careful, your grass can quickly become overgrown and unmanageable. What are your top July gardening tips? 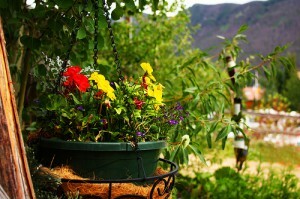 Let us know how you maintain your gorgeous garden during the summer months. Browse our site to find all the products you need to keep your garden looking healthy this summer. This entry was posted in Gardening Advice on July 11, 2014 by peach. Looking for creative ways to freshen up your garden this summer? This time of the year is perfect for experimenting with fun garden accessories that will add a touch of summer style to your garden. If you need some inspiration to get you started, here are some quick and easy gardening ideas to help you create a bright, colourful summer garden. Are you tired of stubbing your toe on your planters and garden edging at night? Adding lighting to your garden is the perfect way to enjoy the warm summer nights and increase the safety of your garden. 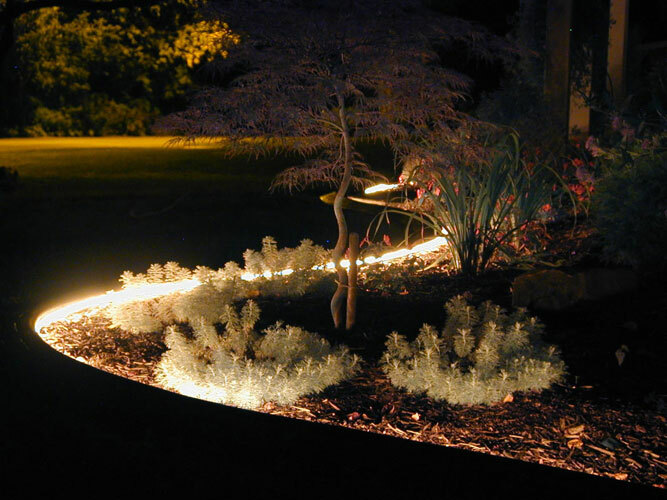 LED rope lighting is a stylish, energy-efficient way to illuminate your favourite flowerbeds and prevent your guests from tripping over your garden borders after the sun sets. We like to use classic white LED lighting for our garden but you can have fun experimenting with different colours of LED lights until you find the one that’s right for your garden. Our top tip is to buy waterproof LED rope lighting so you don’t need to worry about your lights getting damaged if the unpredictable British weather turns stormy this summer. A very cheap and simple way to add ambiance to your summer garden is to recycle your old jam jars by turning them into fun and elegant candleholders. 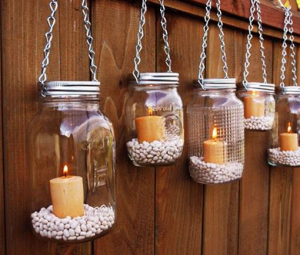 Turning your old jam jars into rustic candle holders is a fun way to decorate outdoor garden parties and BBQs. We love using them to create a relaxed atmosphere that will continue long into the night. Why not use fragrant citrus scented candles that will waft summer scents across your garden party and keep bugs away. How would you like two gardens for the price of one? Adding garden mirrors is the perfect way to enhance your garden by reflecting more light onto your plants and, creating the illusion of a larger space. To create a mirrored garden, position the mirror on a wall which runs alongside a path or, add one onto your fencing in the space between planters to give the impression of a path through to another garden. 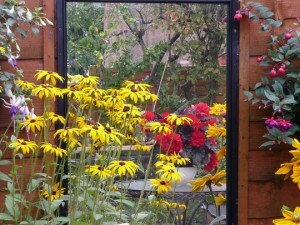 Remember to angle your mirror downwards so it reflects the plants rather than your house! Get the kids outdoors and away from the PlayStation with our fun gardening design ideas that will unleash their creativity. Add a splash of colour to your garden and let your kids get creative by asking them to paint stones that can be used to highlight special areas of the garden. Why not let your kids plant their own flowers as well so they can use their hand-painted stones to mark them out? 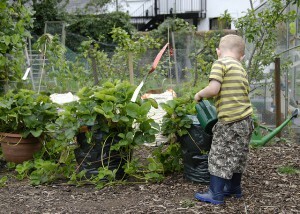 This is a fun way to get your children interested in gardening and, it’s perfect for personalising your summer garden. Remember, it could get messy when you’re painting so we recommend getting the kids to wear old clothes before they start! Colourful stones are also a great way to organise your herb garden! 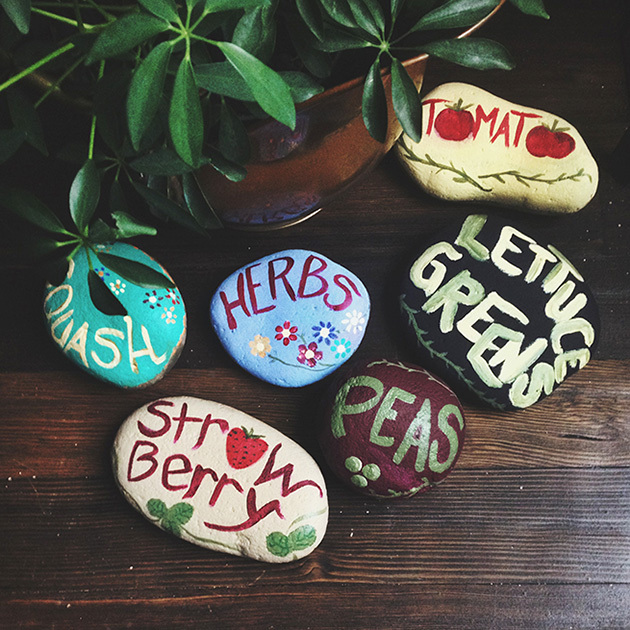 Use colour coded stones to mark out where you’ve planted different types of herbs in your garden. These colourful markers mean that you’ll no longer confuse your Parsley for your Thyme. 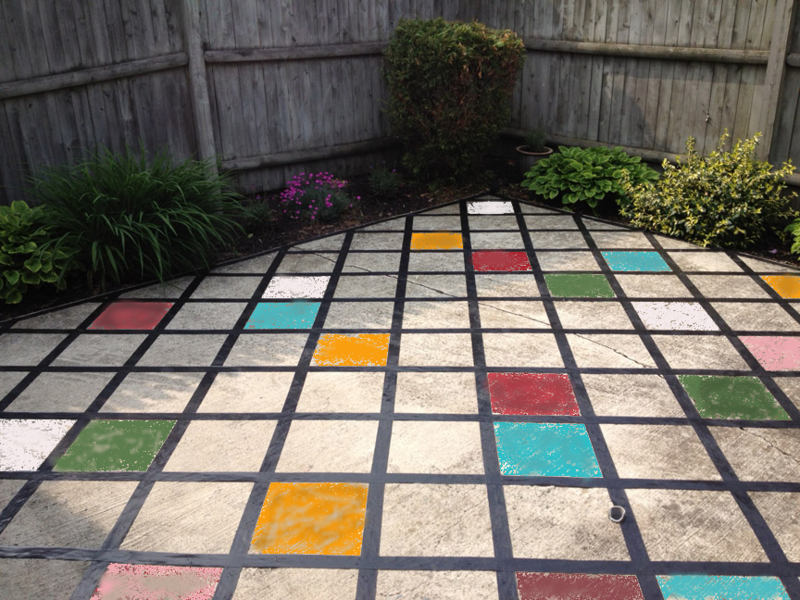 Hang on to any leftover paint as it can be used to brighten up old or tired looking patio tiles. Adding a few accents of colour to your patio is a quick and easy way to completely transform the look of your garden. Colourful slabs will bring the area to life and, your kids will love it. Don’t throw away old household items that you no longer need. 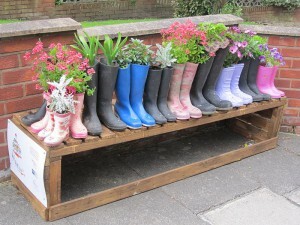 With a little creative thinking you can give them a new lease of life by using them around your garden. Now that the wet winter months are behind us, you can recycle old or worn wellington boots by turning them into colourful planters. Try positioning yours on the doorstep for a quirky way to welcome visitors into your home! 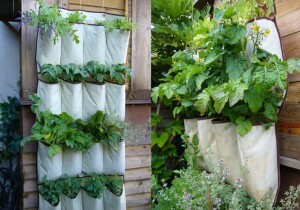 Old shoe racks make fantastic planters for your summer vegetables. Recycled shoe rack planters are ideal for organising your vegetables and, they provide your seedlings with all the protection they need to grow-up healthy. 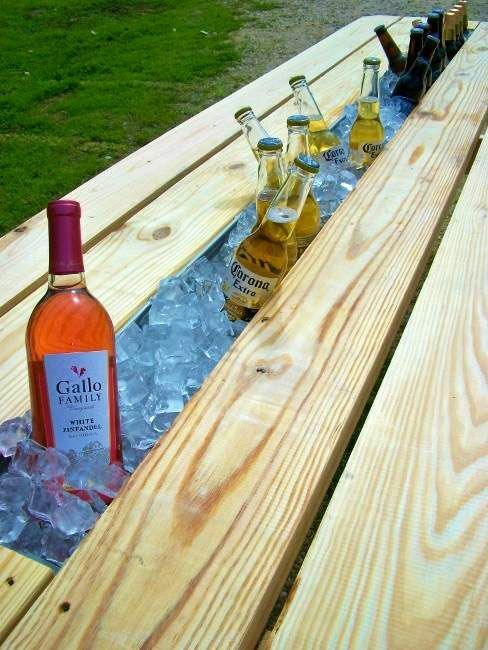 Do you have any other creative ways to freshen up your garden in the summer? Get in touch with your ideas today. Alternatively, why not browse through our website for more finishing touches that are perfect for creating a gorgeous summer garden. This entry was posted in Gardening Advice on July 4, 2014 by peach.